Thirty-eight participants in the debut poll of 2010. Thirty-two (84 percent) pick the Twins to win the AL Central division title. Three apiece (7 percent) picked the White Sox or Tigers. Zero (0 percent) picked the Indians or Royals. From this I deduce that the majority of my respondents are Twins fans. Or, as an alternative deduction, that the ChiSox or Tiger fans reading this are realistic. 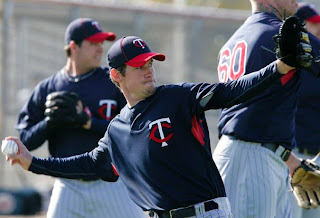 The Twins pitchers and catchers have been in camp almost a week, and the biggest development has been no development. As in no pitchers tossing a few balls and clutching their elbows. Oh, Loek Van Mil, the 7-foot-1 Dutch pitcher who finished last season in Double A, has some shoulder tenderness and is being held back a bit. And Kevin Slowey (above) figures his wrist is never going to feel exactly the same now that it has two screws inserted into it. But that's about it. Last spring Pat Neshek didn't even make it to camp, and Boof Bonser was barely there before he needed surgery. And before the season started, Scott Baker was on the shelf. And that's rather the norm for pitchers. There's a reason for the old adage about how you never have too much pitching. They get hurt. But it's a plus that they're not coming to camp hurt this spring. Monday's print column should have been sufficient wrap-up to this — the idea, after all, was to detail the "case studies" that buttress the conclusions presented in the column. But having actually written them all up, I see a point as yet unmade, at least explicitly. One of the running themes through the 14 — or 19, if you include the five I touched on briefly in the "left out" post — has been this: Catch a lot of games in your 20s, and the odds are you won't do much in your 30s. If the Twins complete this "legacy" extension with Joe Mauer — and they are expected to — they're going to be committed to him well into his 30s. Which means they would do well to avoid breaking him physically. So far in his young career, Mauer has caught 607 major league games, with a season high of 139. Last season, in no small part because he missed April with his back problem, he caught just 109 games. That's too few to justify the kind of money the Twins figure to spend on him. And 139 is probably too risky. I'd like to see him limited to 125-130 games caught a season. But in a 162-game season, it's bound to be difficult for Ron Gardenhire to turn to the likes of Jose Morales almost 40 times. Ozzie Guillen is on Twitter now, posting such gems as 3 day of Spring Training and im already boreddddddd and Estoy lleno un anisito no cae mal ustedes que viene prendan fosforos. Because he's Ozzie Guillen, and because he has earned a reputation for having no governor between his brain and his tongue, and because it's really easy to be misunderstood in 140 characters, this is seen as risky business. "I guess I can't have fun. I flunked in school five times, and I never had as much trouble as I'm having right now. Why do I have to explain to people why I'm doing this? Like I said, I talked to (general manager) Kenny (Williams) about it, it's not anything that involves the ballclub. "There are a lot of people in baseball that have Twitter. Why me? Why do I have to explain why I have Twitter? Obviously, I know I'm the manager of the team and the face of the ballclub, but there are a couple guys out there, I won't say any names, that have Twitter. I hope not too, Ozzie. Rick Ferrell is in the Hall of Fame, for reasons understood only by the people on the Veterans Committee that inducted him. He didn't make the pool because he wasn't that good. He did play until he was 41, but he had just two seasons of 100-plus games caught after age 31. Ray Schalk is also in the Hall of Fame. His credentials: He was a "Clean Sox" — one of the 1919 Chicago White Sox not involved in throwing the World Series — and he held the career record for games caught for 14 years or so. Slightly better qualified than Ferrell, but still a weak selection. Mainly a dead ball era guy, he was washed up after his age 32 season. Joe Torre (photo above) will be in Cooperstown someday for his managerial exploits with the Yankees and Dodgers. He was, or should have been, a strong borderline candidate as a player, probably hurt by splitting his time between three positions (903 games at catcher, 787 games at first base, 515 at third base). He won the Gold Glove at catcher in 1964, which seems preposterous (especially in a league with John Roseboro and Johnny Edwards) — he was never really an outstanding defensive player, and his last game caught in the majors came at age 29. He never caught more than 114 games in a season. Leaving Torre out troubled me a bit because he DID change positions. My sense of it — and this is more than four decades ago — is that he was phased out of catching (1967-1970) because he wasn't that good at it. He was valuable there because he could hit. And then Ted Simmons came along, and suddenly Torre was a full-time third baseman. This is a different situation that Mauer. 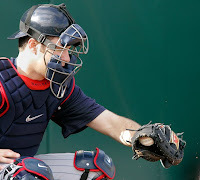 Mauer is regarded as a standout defensive catcher. Moving him to third base would be done to preserve his health. Torre was moved to improve the team. Elston Howard was better than, or at least as good as, some of the guys in the pool. He didn't reach the majors until he was 26 — the Yankees were slow to get in on this integration fad — and then he had to play just about anyplace other than catcher because the Yankees had Berra. He didn't get to catch 100 games in a season until 1961, when he was 32 — about the age much of the pool started to break down — and had a very strong four-year run as a regular, including winning the MVP Award in 1963. Thurman Munson, like Carlton Fisk and Johnny Bench, was born in 1947. He died, as noted in the Roy Campanella comment, in a plane crash as age 32. While his batting average still looked good, his power had pretty much dried up and he was having the back and knee problems that shorten many catchers' careers. Which figures; he caught 130-plus games a year pretty regularly in his 20s. Career highlights: Three times MVP (1951, 1953, 1955). Led NL in RBIs in 153 (142). Named to eight All-Star teams. Regular catcher for five World Series teams, winning one. Roy Campanella's major league career was shortened on both ends — by segregation at the start, by the car crash that left him paralyzed at the end. While many of his old teammates spoke wistfully of how many homers Campy would have hit had he made to the Los Angeles Coliseum with its short distance to left field, it appears fairly clear in retrospect that he was already a shell of his former self when the crash happened. It's a startling thing to realize that out of this pool of 14 outstanding catchers, two — Campanella and Mickey Cochrane — had their careers abruptly ended by life-threatening injury in their mid-30s. And had I gone with a slightly larger pool, it would have included Thurman Munson, who died in a plane crash at age 32. Career highlights: Eleven All-Star teams. Runner-up once in MVP voting, top ten five times. Regular catcher for eight World Series teams, winning seven titles. Had four consecutive seasons of at least .300 average, 20 homers, 100 RBI for the greatest Yankee dynasty, 1936-39. Set a record by catching at least 100 games a year for 13 straight seasons. An interesting career pattern — a Mauer-esque left-handed singles hitter the first half of his career, then a power spike from age 29-33, then a decline. The conventional explanation is that he learned to pull the ball into Yankee Stadium's short right-field porch. Like contemporaries Mickey Cochrane and Gabby Hartnett, Dickey didn't carry the workloads that their modern counterparts frequently do. Dickey had just one season of 130 games caught and was frequently under 110. The difference is probably a combination of better protective gear today and a schedule in the 1930s heavy with double-headers. Dickey had finshed his age 34 season when Pearl Harbor was attacked. He played two more seasons as a half-time starter, missed two seasons to serve in the Navy, then played a little in 1946, when the war was over. My guess is that the war extended his career slightly. Career highlights: National League MVP 1935, runner up 1937. Six All-Star teams (the game was created midway through his career). His famous "Homer in the Gloamin'" was a pivotal moment in the 1938 pennant race. Regular catcher for four World Series teams, none of which won — he was, after all, a Cub. Game caught after age 30 season: 958. Age in last season as regular catcher: 36 or 38, depending on what standard you apply. Win shares after age 30 season: 164. Win shares after age 33 season: 93. It's relatively easy to find possible reasons why modern stand-out catchers last longer than their earlier counterparts: They're in better condition, sports medicine is better, better equipment, PED use ... and none of them quite explain Gabby Hartnett, who remained a productive player deep into his 30s. Of the 14 catchers in this pool, only Carlton Fisk caught more games after age 30 than Hartnett. (Ivan Rodriguez could catch him this season.) Only Fisk and Yogi Berra have had more win shares after age 30, and a good portion of Berra's came as an outfielder. Only Fisk had more win shares after age 33. It is worth noting, however, that Harnett only twice caught as many as 130 games in a season. He missed almost all of the 1929 season, his age 28 season (caught one game). Whether by design or happenstance, he was not abused as a young catcher. 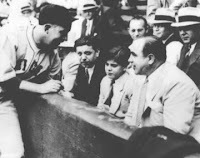 The story behind the photo above of Hartnett and gangster Al Capone: The mob boss took his son to a charity exhibition game between the Cubs and White Sox, and Hartnett, a gregarious sort, agreed to autograph a ball. When the photo appeared in the paper, Commissioner Landis called Harnett in — Landis operated out of Chicago — and ordered him not to do that any more. Hartnett replied: "Judge, if that's your rule, it's OK by me. But I'm not explaining it to him. The next time you see him, YOU explain it to him." Career highlights: Led National League in RBIs, 1984. Named to 11 All-Star teams, won three Gold Gloves. Four seasons of 100-plus RBIs, nine seasons of at least 20 home runs. Four times in top six in MVP balloting. Regular catcher on one World Series champ. Gary Carter wasn't always a catcher. In his rookie season (1975), he played 92 games in right field for Montreal, 66 games behind the plate — and finished second in the Rookie of the Year balloting (behind a pitcher named John Montefusco). The next season, he again caught just 60 times. Then he went behind the dish for good, at age 23. In the next eight seasons, only once did he catch less than 138 games. The Expos used him hard, then shipped him off to the Mets after his age 30 season. Which was close to the point where The Kid's offense went south. He had a good year with the Mets in 1985, dropped a bit in '86 — the World Series year — dropped a bit more in '87 and became a half-time player for the last four seasons of his career. Seeing a pattern here? Young catcher shows he can play a key offensive role, his team keeps him in the lineup day after day, and his bat goes early in his 30s. Which isn't to say it's the wrong way to exploit the talent. In truth, it's the right way — if, like the Expos, you trade him after his age 30 season. The Expos got the best out of him, and then got more talent in exchange. Career highlights: AL MVP 1999. Regular catcher for two World Series teams, one of which won the title. Fourteen All-Star teams, 13 Gold Gloves. Holds career record for games caught. Games caught after age 30 season: 862 and counting. Age in last season as regular catcher: 37 and counting. Win shares after age 30 season: 109 and counting. Win shares after age 33 season: 28 and counting. This may be a guideline of how much teams value defensive tools behind the plate: Pudge Rodriguez is pretty close to useless as a hitter now (his adjusted OPS hasn't been close to league average since 2006), but the Washington Nationals gave him a two-year contract at $3 million a year. Rodriguez was worked fairly hard as a young player — 134 games caught at age 21, 127 at 23, 146 at 24, 143 at 25, 139 at 26, 141 at 27. Then the workload eased for a few years — 87, 106, 100 — and when he left Texas as a free agent after his age 30 season, there was little demand for his services. There was a sense that he was pretty much shot. Not quite. His game revived in Florida and Detroit for three years. Now the bat has quieted, and he's now in the nomad phase of his career — two teams in 2008, two more in 2009, a fifth team this season. He is apparently driven by the desire to be the first catcher to get 3,000 hits — he has 2,711 — and he's still got the glove and the arm to get significant playing time. But his bat hasn't deserved the PT since he was 34. Career highlights: AL MVP in 1951, 1954, 1955; second in 1953 and 1956; from 1950 through 1956, he never finished lower in the voting than fourth. Fifteen All-Star teams. Played in 14 World Series, 12 as a regular; won 10 of those World Series. Five seasons of 100-plus RBIs, 10 straight seasons of at least 20 homers. Games caught after age 30 season: 606. Age in last season as regular catcher: 34. Win shares after age 30 season: 169. Win shares after age 33 season: 70. Yogi Berra had a war to fight before he got his career started — he was in on the Normandy invasion — but he was still only 21 when he made his major league debut. But it took a while for the Yankees to decide that yes, he really was a catcher; for a few years, he split time between the outfield and catching. But once Bill Dickey finished "learning me all his experience" — Berra's memorable phrase —Berra was — in Casey Stengel's words — "my man behind the plate." During that remarkable run of top five MVP finishes mentioned above, Berra never caught fewer than 133 games and was usually in the 140s. That took him though his age 31 season. The catching workload eased off at that point — 121 games in '57, 88 in '58, 116 in '59 — his last season as the clear regular. He was getting older, and Elston Howard was well past ready for duty. Berra is the one catcher in this pool who clearly transitioned from catcher to another position in his 30s (outfield) and remained a regular, at least for a few years. Career highlights: Nine All-Star teams. Six seasons above .300 while catching on an almost-daily basis. Played on one pennant winner, splitting time between catching and DH for the '83 Brewers; no team with Simmons as a regular catcher won even a division title. Games caught after age 30 season: 332. Age last season as a regular catcher: 32. Win shares earned after age 30 season: 69. Win shares earned after age 33: 22. Ted Simmons, like Jorge Posada, was a switch-hitting catcher with the emphasis on hitting, and in the 1970s — when basestealing was far more prevalent than it is today — a bat-first catcher was a bit of a liability. But Simba could hit. In the context of the 1970s, in the context of old Busch Stadium, he was a better hitter than Posada. And the Cardinals used him hard: 130 games caught at age 21, 135 at age 22, 153(!) at age 23, 141 at age 24, 154 at 25 ... if you've ever been in St. Louis in August, you know what a furnace feels like. And he consistently hit .300 through that workload. It couldn't last, and it didn't. When Whitey Herzog took over the Cards, he decided he couldn't live with Simmons' declining defense — or, probably, his stature in the community. Herzog traded Simmons to Milwaukee. Simmons' last season in St. Louis was his age 30 season. He hit .303/.375/.505 with 21 homers — a basic Ted Simmons season to that point. His first year in Milwaukee: .216/.262/.376. Simba had only one St. Louis-caliber season in the last eight years of his career. That came in 1983, when he caught just 86 games and DH'd for the rest of his playing time. Another example of heavy use young leading to a decline late. Career highlights: Widely regarded as the greatest hitting catcher ever. NL rookie of the year 1992. No MVP awards, but runner up twice and in the top 10 of balloting seven times. Nine seasons of 30-plus home runs. Twelve All-Star teams. Regular catcher on one World Series team. Evaluating Mike Piazza's career isn't easy. There's a lot of smoke about him and steroids and very little clarity. There are those who suspect his entire career was a chemical construct. Whether he juiced or not, however, his aging pattern — which is, remember, our concern in all this — followed a traditional path. His offensive numbers fell off in two steps — slightly as he entered his 30s, and more sharply in 2004, which happens to be both the season when the players union agreed to steroid testing and his age 34 season. At that point — whether because he was old or because he wasn't juicing — he was breaking down physically. He fell off to being roughly a league-average hitter — and his defensive skills weren't strong enough to support that. The Mets tried making him a first baseman, but that didn't take, and he reverted to catching in 2005 before completing his career as a DH. It's been so long since I ran one, I almost forgot about them. Johnny Damon has landed with the Detroit Tigers. I feel reasonably certain that this wasn't his top choice, but he and agent Scott Boras mucked up this journey into free agency from the get-go. Damon is replacing Curtis Granderson in the Tigers lineup, as the leadoff man if not in center field. I'd rather have Granderson. Damon makes the Tigers lineup a bit more difficult, but it's still hardly formidable. Miguel Cabrera's a beast, Magglio Ordonez did wind up above .300 last year after his awful start, and now they have Damon to plug into the top of the lineup, but that's pretty much it. Even if Carlos Guillen's career really isn't a rotting corpse, they're going to get subpar offense from second base, shortstop, third base, catcher and center field, and that's a lot of outs to concede. Unless they do try to put Damon in center. But that's a lot of triples to concede. It's a weird roster right now. The pitching could be good; the offense probably won't be. And the defense will lean heavily on a pair of up-the-middle rookies. Career highlights: Regular or quasi-regular catcher for four World Series winners, two other pennant winners; has played almost a season's worth of postseason games. Finished third in MVP voting in 2003, sixth in 2007. Five 90-plus RBI seasons. Five All-Star teams. Games caught after age 30 season: 702 and counting. Age is last season as regular: 37 and counting. Win shares after age 30 season: 140 and counting. Win shares since age 33 season: 72 and counting. Jorge Posada was not blessed with top-grade defensive skills behind the plate, but he gets the job done — and he has always been able to hit. This will be his age 38 season, and as spring training opened last week his manager (and former co-catcher) Joe Girardi said he was looking for 115 games or so behind the dish for Posada: "He's caught a lot of ballgames in his life. We want to make sure that he's strong and healthy all year long." Most of those games came after age 30. Posada reached the majors to stay in 1997 and spent three seasons essentially splitting the job with Girardi, who was a defense-first catcher. 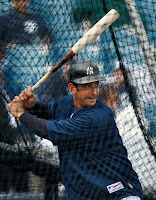 Posada took over the job fulltime in 2000 and had a streak of eight straight seasons of 130-plus games-caught seasons. He had significant injury problems in 2008 and was limited to 100 games caught last season, so 115 this year might be pushing it. Still, he has been one catcher who has performed well deep into his 30s — and as with Fisk, the fact that he wasn't pushed hard in his 20s may well have something to do with that. Career highlights: National League MVP 1970, 1972. NL Rookie of the Year 1968. Led NL in home runs twice (1970, 1972) and in RBIs three times ('70, '72, '74). Thirteen All-Star teams, 10 Gold Gloves. Played in four World Series, winning two of them. Note: Bench and Carlton Fisk were born in the same month (December 1947), and their slash stats are very similar. The batting averages and OPB are almost identical; Bench has a 20-point advantage in slugging percentage. Bench got to the majors first, was used hard and flamed out. Fisk never reached Bench's peak performance, but he lasted a good 10 years longer than Bench and wound up catching nearly 500 more games. Career highlights: Rookie of the year in 1972. 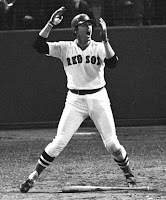 His home run in Game 6 of the 1975 World Series was not only dramatic, it changed the way sports are televised (NBC lucked into the reaction shot of him waving the ball fair). Eleven All-Star teams, one Gold Glove, high of third in MVP voting (1983). Led league in triples in 1972. How long did Carlton Fisk's career extend? The man hit 37 homers (his career high) at age 37. He also stole 17 bases that season. He made his major league debut at age 21, and left the field at age 45, having set the record for games caught (since broken by Ivan Rodriguez). Paradoxically, I believe that one reason for Fisk's longevity was injuries. He played in just 52 games in 1974, 79 games in '75 — the result of a horrific knee injury that could have ended his career early. While the injury took away the equivalent of a full season from him, it probably helped in the long run by giving him an extended break from the daily grind of squat-and-rise that does incremental, long-term damage to the back, hamstring and knees. Whatever the cause, Fisk is the one most obvious outlier, the catcher who maintained his level of performance literally for decades. Career highlights: National League MVP in 1938. Led NL in batting average in 1938, 1942. Regular catcher for two pennant winners, one World Series champ. Seven-time All Star. Games caught after age 30 season: 851. 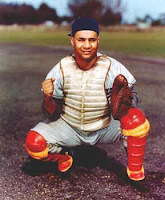 Age in final season as regular catcher: 37 (1945). Win shares age 30 and on: 133. Win shares after age 33: 60. Ernie Lombardi must have been an incredibly fun player to watch. To begin with, he was probably the slowest man ever to play in the majors. And one of the most savage line-drive hitters ever as well. He whistled base hits into the gaps into what were essentially five-man outfields, as the middle infielders didn't have to play him honestly. His batting grip intertwined the little finger of his top hand with the index finger of his bottom hand. And he had this incredible nose, so long that it stuck out through the slats of his catchers mask and was occasionally skinned by foul tips. World War II was doubtless a significant outside influence on his aging pattern. He had had a down year in 1941, his age 33 season — but then the war came that winter. While most major leaguers went into the military, Lombardi failed his draft physical, and he got to play for the duration, three good seasons and one poor one. 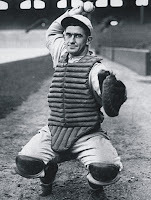 He hung around as a reserve catcher for two more seasons after the war ended. My guess is that the war extended his career. He had good numbers during the war years, but that was against diluted competition. On the other hand, he didn't embarrass himself at the plate after the real players returned. Career highlights: Spent entire career with Detroit Tigers. Second in MVP voting in 1968, when Tigers won the World Series; third in 1967. Made 11 All-Star teams, won four consecutive Gold Gloves. Games caught after age 30 season: 335. Age in last season as regular catcher: 33. Win shares age 30 and on: 75. Win shares after age 33: 20. Bill Freehan's not in the Hall of Fame largely because he was unwise enough to center his career in the high-mound era of the 1960s. A secondary reason may be that just as his star was brightest, Johnny Bench emerged in the other league. And he is the most marginal of the 14 catchers in this study. Freehan's last season as a regular catcher was in 1975 at age 33, but that followed a season in which he split time between catching and first base. And the difference — in 1974, he hit .297/.361./.479. In 1975, .246/.306/.398. That was followed by a season as a reserve catcher, followed by the end of his playing days. As a starting catcher, Freehan's offense fell off the cliff in his early 30s. Career highlights: AL MVP in 1928 with Philadelphia Athletics, again in 1934 with Detroit Tigers. Led American League in on-base percentage in 1933. A regular on five World Series teams in seven years, player-manager for two of them. Games caught after age 30 season: 231. Age in last season as regular catcher: 32. Win Shares age 30 and up: 79. Win Shares after age 33: 5. In many ways, Cochrane is the best comp among catchers to Joe Mauer. A left-handed hitter better known for batting average and eye at the plate than for power, he scored 200-plus more runs than he drove in. His last season as a regular was at age 32, when he caught 110 games for the Tigers (1935). He appeared in just 44 games in 1936 and 27 in 1937. The dropoff in playing time in 1936 came from a mental/emotional breakdown apparently brought on by the strain of being a player/manager/general manager. On May 25, 1937, he was hit in the head by a Bump Hadley fastball; the beaning was nearly fatal, and he never again took the field as a player. Career prematurely shortened, but perhaps not because he was a catcher. In working though my thoughts on the subject I reviewed the careers and aging patterns of 14 top-flight offensive catchers. Nine of them are in the Hall of Fame; the five who aren't either are not eligible or are (my opinion) a mistake by the voters. There were three guys I considered including but didn't; I chose a deliberately high standard. The 14, in alphabetical order: Johnny Bench, Yogi Berra, Roy Campanella, Gary Carter, Mickey Cochrane, Bill Dickey, Bill Freehan, Carlton Fisk, Gabby Hartnett, Ernie Lombardi, Mike Piazza, Jorge Posada, Ivan Rodriguez and Ted Simmons. Left out: Joe Torre (spent much of his career at first or third base); Thurman Munson (died at age 32) and Elston Howard (caught behind Berra in the Yankees system, he didn't become a regular catcher until already into his 30s). Everybody's career is a bit different, of course. None is a perfect comp for Mauer, who, as I've written before, appears to be a historically unique player. What I'm going to do here, bit by bit, is detail the aging of each of the 14 — something there simply isn't room to do in the paper. Hey, I've done the work, I might as well share it with you. Curtis Granderson — former Detroit Tiger, even more former Mankato Masher and now a new member of the New York Yankees — combines his trademark high socks with the Yankees workout gear. Derek Jeter can't bear to look. It's been more than a week since my last post, a rare bit of on-line silence from me caused by a shortage of compelling baseball news and a bit of a virus. But it's time to re-emerge. The first major league training camps officially open today. Not the Twins. They're typically one of the last to open camp, and in their case pitchers and catchers don't report until Sunday with first workouts on Monday. All that's official, of course. Unofficially, players are already throwing balls and swinging bats at the various spring training facilities — as seen in the above Granderson-Jeter pic. Johnny Damon remains without team. Various reports have the Tigers being the lead suitors for the alleged outfielder, although at this point it's difficult to imagine that Detroit has indeed offered him a two-year, $14 million deal. He and greed-master agent Scott Boras can't possibly imagine at this point that anybody else is going to surpass, or even match, that figure. Boras got dumped last week by another unsigned player, Felipe Lopez. 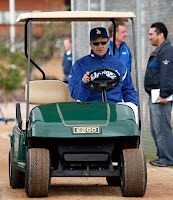 The (sarcastic phrase alert) always classy Boras responded: "We wish Felipe well. He's a fine player. We understand that a player gets frustrated when we contact all 30 teams numerous times and there is not a starting job for him." Methinks there was a starting job for him — at a certain price point. Just as there was a price point at which Damon would still be a Yankee. Yes, he is. The Twins signed their former mainstay to a minor league deal Tuesday, and also lost Jason Pridie, who had figured to compete for a spot on the 25-man roster, on waivers to the New York Mets. See the Twins announcement here. I continue to doubt that the Twins want to go without a legitimate reserve outfielder. There is a genuine function there beyond spelling Denard Span, and I don't see Ron Gardenhire being comfortable using Nick Punto to sub for Delmon Young or Jason Kubel in the late innings. That said, if I'm Matt Tolbert, I'm bringing an outfielder's glove to Fort Myers. Whether Jones is a viable option is unknown. He's played very little the past two seasons — little and poorly, at least in the majors. I believe he was playing in an independent league last summer, and he was at the winter meetings in December looking for a team. He turns 35 in April. 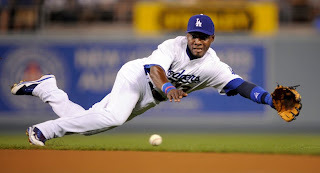 But the Jones of 2007 was a legitimate center fielder defensively. If he can still move, and if he can hit righties, there may be a job for him. The other item in the press release — the invite to major league camp for Toby Gardenhire — is nothing. 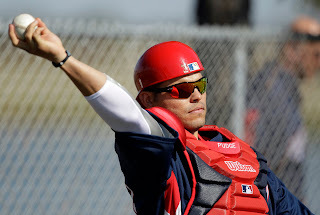 With Jose Morales' surgery, the Twins simply needed another catcher in camp to catch the pitchers in their throwing sessions. Don't read nepotistic implications into it. 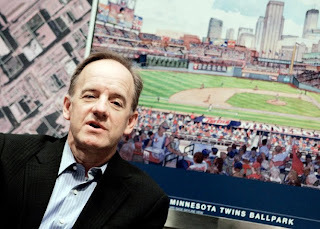 One reason the Mark Rosen notion — that the Twins and Joe Mauer have the framework of a deal in place awaiting the final details — made sense was the possibility that the two sides were working on a schedule of deferred payments. We try to stay away from deferred compensation. There's a ton of real-life examples of that kind of thinking. It's either going to be somebody else's problem, or we'll worry about it later. Eventually, you've got to worry about it and then, at that point, it affects your current operation. So it's really not a good thing. In the end you've got to pay the money no matter what. You may as well try to do it when the player is playing for you. Another indication that the Pohlads are in it for the long haul. Many of the deferred comp cases came from owners who intended to sell the team before they started paying out big bucks to players no longer active. I think the Pohlads are right to stay away from deferred comp. But it does raise the question: If Rosen's report was accurate, what would be delaying the deal? When is a retired number not retired? Usually it's when the player himself returns to uniform. If Rod Carew, for example, had taken the Twins batting coach position a few years ago when it was open, he'd be wearing his retired No. 29. Vizquel has worn No. 13 through his career, but that's Ozzie Guillen's number, and the manager was keeping it. The Yankees inked veteran OF Marcus Thames to a contract Monday, adding to a crowded field of candidates for the left field job. Given the Yankees affection for veterans, the general expectation is that Thames and Randy Winn will platoon in left. Then there's Brett Gardner, who is faster than the other two — and the NUN, New Ulm Native Jamie Hoffmann, the forgotten outfielder on the champs' roster. It gets increasingly difficult to see how the Yankees can carry that many outfielders. Meanwhile, I keep looking at the Twins roster and seeing a need for a reserve outfielder who can play defense ... and wondering if there's a fit there for Hoffmann. One of the big things in the modern era of ballparks is statues of heroes of the past. PNC Park in Pittsburgh has Honus Wagner, Willie Stargell and Roberto Clemente — and a few days ago the model for a fourth work of bronze, of Bill Mazeroski running out his famous home run in the 1960 World Series, was unveiled (photo above). Miller Park in Milwaukee has Robin Yount and Hank Aaron — and, it was announced Monday, will this summer add one of Bud Selig. I'm not a big fan of his work as commissioner, but he certainly is a crucial figure in the history of baseball in Milwaukee. Comerica in Detroit is littered with them — Ty Cobb, Hank Greenberg, Al Kaline, Charlie Gehringer and Willie Horton. (One of these is not like the others.) The White Sox' stadium sports bronze replicas of Nellie Fox and Luis Aparicio turning two, among others. Wrigley Field features one of Harry Carey. Then there's St. Louis, home of perhaps the most famous ballpark statue, that of Stan Musial. Supposedly the Cardinals commissioned a second statue, this one of Mark McGwire, and then the steroid scandal erupted, and the work went into storage. The Selig news in particular got me thinking about this. Such works used to be fairly common pieces of public art — military or political figures of importance immortalized as civic inspirations. John Johnson outside the Nicollet County Courthouse. Col. William Covill Jr., hero of Gettysburg, on the Capitol Mall in St. Paul. That practice has fallen out of favor — except at the ballparks. 1) He is a switch-hitter who is notably stronger against right-handed pitchers (career OPS as LH hitter .796, as RH hitter .725). As a counterpoise to the Twins left-handed bats (Joe Mauer-Justin Morneau-Jason Kubel-Denard Span), he's lacking. 2) He is slated to hit second for the Twins, but he has actually been a more effective hitter batting third — OPS .793 in 979 plate appearances in the three-hole, .770 in 1,264 PA second. That is more likely to be the result of environment than batting order. Most of his time hitting third came with Arizona, and the Diamondbacks' home park is a very good place to hit, certainly better than his home park last season. 3) His highest OPS in four American League seasons: .779 (2004, with Toronto). His lowest OPS in four National League seasons: .774 (2009, Los Angeles). 4) He has been the regular second baseman for two playoff teams in the past three seasons, but has a total of four postseason plate appearances — part of a pattern of late-season injuries. In 2007, when Arizona won the NL West title, Hudson broke his thumb in August. Done after 107 games. In 2008 — not a playoff season — he dislocated his wrist in September. In 2009, with Los Angeles, he got benched late in the season in favor of Ronnie Belliard. There was speculation that his wrist was bothering him last September and October, but he denies it. 5) He is not particularly fast — mobile enough to handle a middle infield job, but not a true burner. Even in his 20s, he never hit double digits in triples and only once stole as many as 10 bases. Last year he was eight of nine stealing — a very good percentage, but not a lot of attempts. Baseball Info System's baserunning stats make him +8 last season, most of that from the base stealing. 6) His career is following a pattern that appears to be a new standard — the first four (cheap) seasons with his first team (Toronto); the late-arbitration/first free agency seasons with a second team (Arizona); and a nomad phase now that he's in his 30s. We are seeing few long-term contracts these days for non-superstars ages 30 and up. Blame (or credit) the Bill James influence for this; increasing numbers of front offices now know that the vast majority of players peak at age 27, and that from age 30 on, half of the players wash out of the majors every two years. 7) Hudson was selected in the 43rd round of the 1997 amateur draft, Not many players selected that late make it to the majors, much less enjoy the success Hudson has. In 2002, when he was regarded as the Blue Jays' top prospect, he lost out on the second base job in spring training to Joey Lawrence, who had been a first-round pick in 1996. Lawrence washed out, and Hudson got the job a bit belatedly. Riccardi, it is safe to say, was not amused. 7) Through all the shifts in context, he has been remarkably consistent in overall value. His high in win shares since 2003 is 21; his low is 15. To put that in context, Alexi Casilla has 14 win shares in his entire career. 8) He is a very pronounced ground ball hitter. Last season, according to Baseball Info Systems, he had 2.17 grounders to every fly ball — the sixth highest such ratio in the majors. Second baseman Orlando Hudson — four-time Gold Glover, two-time All-Star — agreed to a one-year deal with the Twins late Thursday. Hudson's 32, and while there is chatter that his play has fallen off since he dislocated his wrist late in the 2008 season, it's difficult to find evidence of that in his stats. I can imagine Hardy and Young being transposed. I figure Punto ranks ahead of Brendan Harris because Punto is the better fielder and baserunner and has the better on-base percentage. Harris' one advantage over Punto is power, and we're not talking Jim Thome here. reserve outfielder (Jason Pridie has the edge) — to be a defensive sub for Young or Kubel, back up Span, to pinch run for Kubel or Thome. Legs and a glove. There's no room there for either Alexi Casilla or Matt Tolbert, and both (I believe) are out of options. It's certainly possible that the Twins could slip either through waivers, although I can think of a couple of teams in the Twins division that might be better off with Tolbert in their lineup than with the infielders they currently have. I rather suspect that Gardenhire would prefer Tolbert to Harris. But Harris has a new two-year contract. And I have difficulty imagining Gardenhire feeling comfortable with Punto or Tolbert in the outfield in anything other than an emergency or a blowout. A surplus of utility infielders is not normally regarded as the basis from which to make a trade. But if the Twins can move one of those guys — Punto, Harris, Tolbert or Casilla — for a more reliable fourth outfielder, they should. Mark Rosen (WCCO) says (citing an source he doesn't name) that there's agreement on the framework of a 10-year contract between Joe Mauer and the Twins. Peter Gammons tweets: "Mauer contract is far from done, and could be quite some time before it's completed." Who's right? Neither. Both. Either. Wake me, boys, when you have sources you can name. Until then, you can be making this up or being fed something by somebody with an axe to grind. It'll be news when it's done and gossip until then. 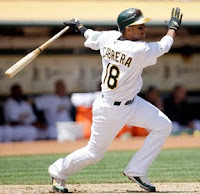 Orlando Cabrera has reportedly reached an agreement with the Cincinnati Reds, pending physical and other formalities. Ron Gardenhire, even after the Twins traded for J.J. Hardy, talked about wanting to keep Cabrera to play second base. From this distance, it's unclear if Cabrera didn't like that idea or if other people in the Twins organization didn't like that idea. At any rate, Cabrera and his diminishing range will be deployed at short again this year, just not in Minnesota. All this further drives down the possibility of adding another veteran infielder. Reports out of TwinsFest this weekend downplayed the Joe Crede notion, and I had already written off the notion of a third base acquisition anyway because of the pinch-hitting implications. Orlando Hudson might still be a possibility, but one must remember — he lost his job in L.A. to Ronnie Belliard last summer. When the Jim Thome signing is finalized — he was supposed to have a physical while in town for TwinsFest — somebody will have to come off the 40-man roster. That should happen in the next day or so. While I still expect Glen Perkins to be traded, it now appears that won't happen until he's demonstrated in exhibition games that his shoulder is sound. And for that matter, one never knows that injuries will pop up among the Twins pitchers. They may still need Perkins. Alexi Casilla had a good playoff series in the Dominican this winter, and unless the Twins do bring in a veteran infielder, he's in the mix for a lineup spot. He and Matt Tolbert are both out of options, and it's difficult to see both of them making the 25-man roster. LaVelle Neal suggested that the Twins could carry them both over Jason Pridie, but I believe the only way that's happening if if Gardenhire is comfortable with the notion of playing one of the infielders in center for three or four days if and when Denard Span gets one of those day-to-day nagging injuries that don't merit putting him on the disabled list. Yeah, Michael Cuddyer played some center last season, but that was in Wrigley Field, the smallest center field area in the majors. In normal parks, Cuddyer in center is an invitation to triples.